On Monday Ged and I drove to the Cold Fell Road to walk up two more Outlying Fells, Cold Fell and Flat Fell. Two short walks separated by a five minute drive and lunch. There were blue skies north but a big mass of cloud was keeping us in the shade. View from the parking spot just after the cattle grid on the Cold Fell Road. Cold Fell is ahead, just walk up. Ged and Blackcombe. There is no summit cairn. Clear skies ahead, but the sun is still behind the mass of cloud. Worm Gill going up towards Caw. We head back down aiming for the Friars Gill path. We are heading for the end of the copse, needing to cross Friars Gill in the dip. We head down into the ravine, climb the fence and cross the gill quite easily. We head across the footbridge and up the hill for the view. Looking back the way we have come. The view back across to Cold Fell. We continue up a bit more. The view back again. 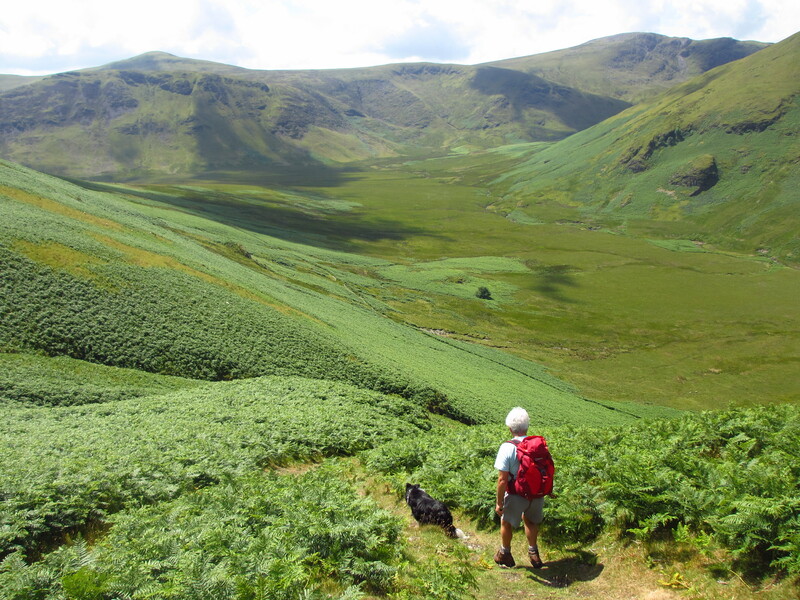 Time to head back to the car and our next walk up to Flat Fell. This walk was under three miles. I drove further along the Cold Fell road parking next to the Kinniside Stone Circle. The view across to Flat Fell. There is a deep ravine that goes round the western edge. The path down into the ravine starts just to the right of the stone wall. So you need to go down before you go up. This path goes along side the north of Flat Fell all the way to Cleator Moor. When we reached the top of the rise we were directly in line with the summit so we just headed up the grass, which was soft and mossy. The Cleator Moor path is by the wall. Great views out towards Knock Murton. Views over the Solway Firth to Scotland. The distinctive summit cairn. I've not seen another one like this. The fells are Knock Murton, Blake Fell, Gavel Fell, Whiteside, Hopegill Head, Grasmoor, Great Borne, Grike and Blakely Raise. Close up of Knock Murton, Sharp Knott and Blake Fell. Grike, Blakely Raise and Lank Rigg. The view east, out to sea. Dent on the left. We chatted to the man with his Border Collie on the summit. The Scottish Hills beyond the wind farm. We head back down into the ravine. Only the climb out to come! This walk was only a mile and a half. As we were so near we continued on to Ennerdale Water. Great Bourne, Bowness Knott, Starling Dodd and Red Pike in the sunshine. The combined walks were about five miles. Very easy. This entry was posted in All, Outlying Fells on 26/11/2018 by admin.